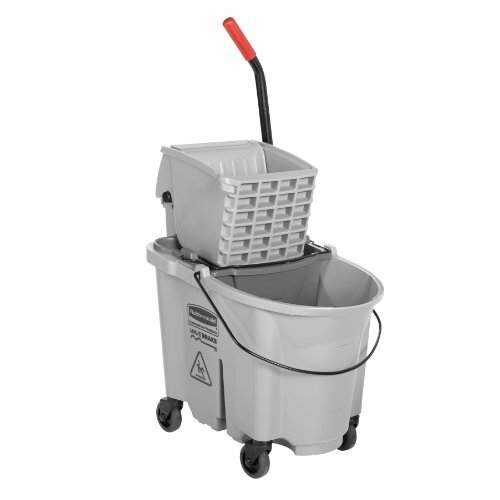 Rubbermaid Commercial 1863897 Executive Series WaveBrake High-Performance Side Press Combination Mopping System, 35-Quart. Suitable for commercial and industrial applications, and can help earn Leadership in Energy and Environmental Design (LEED) credits. Side press wringer is tested to exceed 50,000 wringing cycles and has a tubular steel arm with contoured handle for better grip. Suitable for commercial and industrial applications, and can help earn Leadership in Energy and Environmental Design (LEED) credits. Rolls on four non-marking casters for mobility. Metal wire handle to facilitate lifting and emptying. 36.5 inches by 15.7 inches by 20.1 inches. Yellow color for low-risk restroom areas such as sinks and mirrors as part of a zone isolation system. Mop bucket and ringer are made from structural web-molded plastic, with better strength-to-weight ratio than standard injection-molded plastic. Side press wringer is tested to exceed 50,000 wringing cycles and has a tubular steel arm with contoured handle for better grip. Suitable for commercial and industrial applications, and can help earn Leadership in Energy and Environmental Design (LEED) credits. Rolls on four non-marking casters for mobility. Metal wire handle to facilitate lifting and emptying. Molded wave baffles reduce splashing. 36.5 inches by 15.7 inches by 20.1 inches. Yellow color for low-risk restroom areas such as sinks and mirrors as part of a zone isolation system.